In the chart below I highlight the CRB Index and the fact that at (A) it has rallied back up to test former 40-yr support line (1) after reaching less important, temporary support line (2) in Feb-16. Note that former 40-yr support line (1) is the the same support the CRB Index crashed below in late 2015 / early 2016 amid the global commodity route induced by the WH/Fed. Prior to doing so the Index had never broken below that support dating back to the early 1970s commodity boom that was launched when the US abandoned the gold standard in 1971. Regardless, as the CRB Index approaches line (1) again, but this time as resistance and not support, our reflation thematic will face its first true test. As such, the potential for a near-term pause in commodity price upside in the short-term is very much in play. Ultimately, for our thematic to have merit we’d like to see the Index reclaim former resistance on the upside and maintain it moving forward. Just a short-term heads up to keep in mind from a positioning standpoint. However, long-term, as we have pointed out previously, the big picture thematic will increasingly revolve around a world shifting away from its decade-long deflationary anchor into one that will be ruled by “reflation” and ultimately, inflation. No chart better lays out the case for this outcome than that of the 100-year Producer Price Index (all commodities), or PCAC Index on Bloomberg. Per the CPI plot in the lower pane, note that all three ultimately launched us out of a deflationary world into one that was inflationary! Conversely, the generalized decline in the PCAC Index over the past decade has been associated with a decline in CPI. 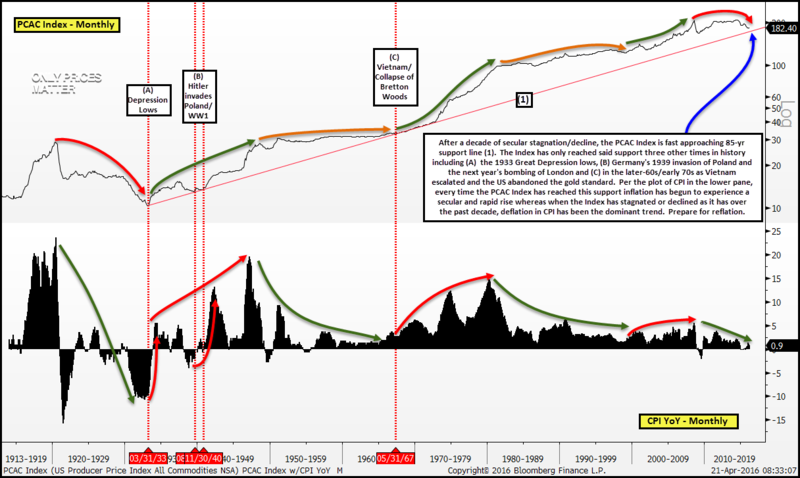 Where the PCAC Index above stands in relation to 85-yr support line (1) is also interesting in the context of what PIMCO proposed this week, namely that the Fed come out and inflate away the economy’s debt via a major revaluation of gold, citing the success the country had doing the same in 1933 when Executive Order 6201 was issued (for the record, I believe any such move is more likely to be done by the PBoC than by the Fed). Ironically, this order was issued at the very moment in 1933 at (A) in the chart above where line (1) support begins! As I say, major fundamental catalysts occur at major technical milestones on charts.